Sixth time down to Coburn PA for the Wilderness (fifth time as a Masters 50+) for the 101mile and 11,000 foot climb odyssey, and lucky enough this time to be standing atop one of the Masters boxes there! Finally had a first good clean Wilderness ride, with one previous year having been flats-cursed and another four marred by going off-course at some point losing time to backtracking (my own fault each with my pain cave downward crossed eyes missing the adequate arrows). Rain made for a peaceful-sleeping pitter patter the night before, and was also well-timed coming to a halt a half-hour before start, giving way to beautiful weather for the race, though leaving some slick rockpiles on the early singletrack section of the course ‘Three Bridges’, and the lower section of ‘New Laurel Run’ trail serving as a good stream line for that water to flow to and off the hillside despite some obvious recent re-working, before drying out for the balance of the day. I enjoyed riding nearly all of the first 50miles of the race with my northeastern Master neighbor Keith Button from CCB, including riding away together from a Masters-heavy group including local favorite Jim Matthews around Mile 15 on the long gradual Crowfield ascent. Jim went screaming back past me though on the following long and gradual Detweiler descent, during which I smashed at speed my upper lip into a bee that stung me in the process, leaving me a bit distracted about whether an anaphylactic reaction as I've suffered before would follow but fortunately this time I was fine getting away with just a hugely histamine-swollen upper fat lip, as too unfortunately obvious still in the podium picture ~8hrs later! At the bottom of the descent, Keith and I again gathered together to chase up to the Lonberger Path and Three Bridges. At Aid Station #3 at the top of the subsequent climb at Mile50 Keith had to pull over with both his bottles empty, while the comfortable temps and my third bottle allowed me to continue with an earlier entry into the PigPile singletrack, with a couple subsequent passes providing a buffer where Keith got gapped off for the balance of the race to eventually finish up twelve minutes back yet with a very nice 4th place. At the bottom of the descent that closes off Pig Pile Jim Matthews had suffered a flat, affording me the opportunity to slip ahead of him. In his subsequent chase he apparently suffered flats again in the long off-camber rock-strewn bench cut of ‘No Name’ trail and pulled the plug on the race after limping into Aid Station #4 (highway underpass) at Mile66. The rest of the race was pretty smooth and uneventful, much of the time on my own and not seeing anyone who seemed to be Masters-age competition. After the subsequent climb, it was especially welcome at this point in this year's version of the course to not have to descend the long gradual jarring washed-out Panther Hollow but instead enjoy a smooth and very scenic flyer down the dirt road Siglerville/Millheim Pike, though there was a price to be paid with the correspondingly additional climb of the Havice Valley dirt road. The two dark tunnels and the rough section of the Fisherman Trail thereafter are always menacing, but at least they assure you of the proximity of the finish, which I reached right at the 9 hour mark. Having noted that a couple of the usual Masters heavyweights (Jeff Clayton out West doing head-to-head battle with Greg Golet for the NUE series lead at Breck 100, Roger Masse also absent) were not signed up this year, I had been thinking along the ride that if it continued smoothly I might have some shot at a podium, though worried about their absences being balanced of by some newly-50 racers now in the Masters not yet really on my radar screen. Indeed, I had no idea that my upstate-NY racing neighbor Joe Johnston was now 50, and he took 2nd not surprisingly as it has been years since I was last able to beat him. 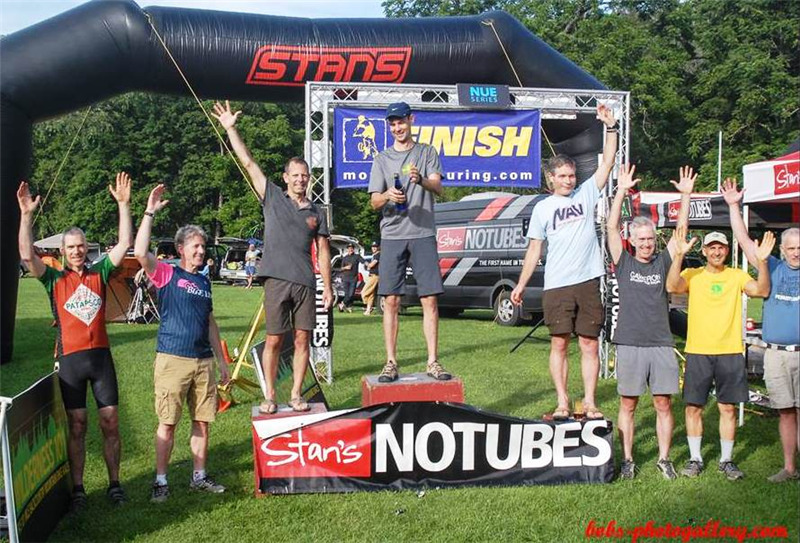 And similarly new-50 Russell Spaulding out of Tennessee, who had beaten me by a position or two at each of my previous two National Ultra Endurance series ‘hundies’ for the year (Mohican and Lumberjack) was there too and took his first NUE series Win - congrats Russell! But I was thrilled that it was only the two of them, and that out of the 25 Masters that took the start line was a 3rd box for me to step foot on.